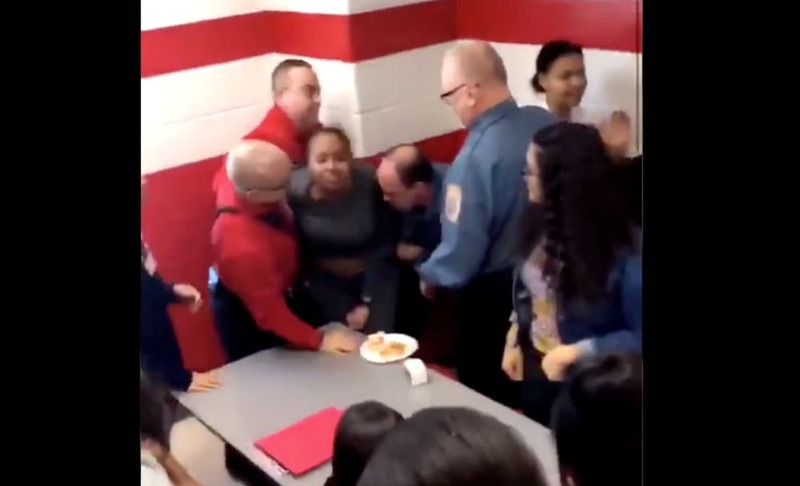 This week disturbing footage emerged on social media of what appears to be a Black female student being violently detained by officers while her classmates looked on in shock and terror. In the accompanying clip, a young woman at the Pennsylvania high school, is surround by what appears to be a group of security officers who are attempting to subdue her. One officer punched the girl in the legs and kneecaps, then slammed her head onto a lunch table as two other men in red shirts pinned her arms. The officer then aggressively grabbed her ponytail and held her down. As classmates tried to rush to her aid, the girl attempts to stand up, but the officer and a man in a red shirt twisted her arms behind her back. When a faculty member intervened, the girl gained her footing and stood up. Meanwhile, classmates jumped on tables and benches to corner authorities to demand answers about the use of excessive force by multiple officers against one Black girl. The victim was escorted out of the frame, as the videographer scanned the room to show dozens of outraged students. While no one at the school has made an official statement, students took to social media to share updates and their experience with faculty afterwards. “Look how the cops whole demeanor changed when they all stood together,” wrote one viewer, referencing how the aggression on the video visibly dissipated once the victim’s classmates collectively stepped in. “The fact that he said there was no further action being taken out on the security officers but an on going investigation against the student? Completely defended their actions slamming her head down/ pulling her hair/etc. This school is trash the people that work there are racist,” another student posted. Head of security at the high school, Chief Edward Henry told me that if I saw the entire video I would understand. I told him there was nothing he could show me that would justify the extent of force used against this woman!! This story is still breaking and we will keep you posted on details as they emerge.